Sundance is one of the few major international film festivals that doesn’t commence with a single opening night selection, but several: Four competition titles are divided into two double features, with a shorts program also available for those into the whole brevity thing. Yet were the programmers to narrow their inaugural evening to just one movie, they’d be hard-pressed to find a better candidate than Whiplash (Grade: A-), which landed last night like a thunderous cymbal crash. The second feature from Damien Chazelle (Guy And Madeline On A Park Bench), it’s the rare music movie to focus not on the joys of playing, but the sheer, punishing hardship of the craft—the insane discipline required to succeed in this fiercely competitive field. For Sundance, the film feels like a model example of how to kick things off in style. The festival has set a high bar for the next week and a half. Coloring his usual boyish charisma with a dark shade of obsession, Miles Teller stars as Andrew, an aspiring jazz drummer taking classes at a prestigious music conservatory. Andrew wants to be one of the greats—he disappears into Buddy Rich records and plasters his walls with photos of the greats—so when a revered instructor, Terence Fletcher (J.K. Simmons), handpicks him for the jazz-band orchestra, it seems like a dream come true. As it turns out, though, Fletcher’s reputation as a notorious perfectionist doesn’t do him justice: He’s more drill sergeant than teacher, waging psychological warfare on his students and playing cruel mind games to “inspire” the troops. As in the Cassavetes-indebted Guy And Madeline, Chazelle builds his movie around music rehearsals, but the practice scenes here—gauntlets of negative reinforcement, tests of patience and fortitude—privilege grueling repetition over joyous improvisation. Jazz is not “fun” for these budding musicians; it’s a crucible. In its feverish tempo, set by the near-constant click of a drum beat, Whiplash moves like a thriller. (Early comparisons to Black Swan are not off base.) The film is as meticulously precise, and as thrillingly volatile, as the music it celebrates. Spending endless hours behind his kit, Andrew drums until his hands literally bleed, and Teller—panting, grimacing, pushing past the agony—makes the audience feel the character’s pain. The Spectacular Now, the Sundance movie he appeared in last year, should have made Teller a star. I have a feeling that Whiplash, which reveals a bold new intensity, will. Certainly, Teller holds his own against Simmons, who hasn’t been this intimidating—this magnetically loathsome—since his days on Oz. Whether delivering withering personal attacks or silencing an imperfect player with a clench of the fist, the actor turns his character into a thrillingly complicated villain. Is Fletcher a brilliant teacher, doing what it takes to mold potential into greatness? Or is he a sadist who uses his position of power to tear down the young men he deems unworthy of their instruments? Whiplash spins thrillingly around that question, turning inspirational-teacher cliché on its ear. Some have already called the film’s romantic subplot a distraction, but in a sense, it’s supposed to be: For Andrew, happiness and greatness may be mutually exclusive; to achieve his potential, to make it into the pantheon, he has strip his life down to nothing but effort and rhythm. (The film’s attitude toward that attitude is fascinatingly ambivalent, leaning towards sympathetic.) 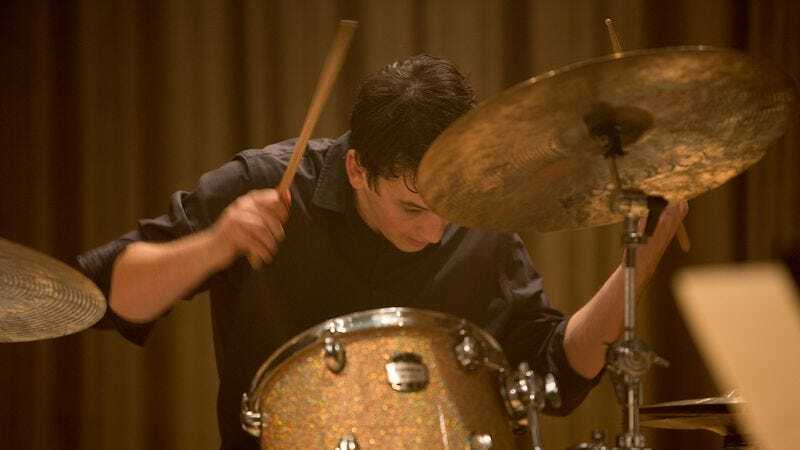 In its astounding final stretch, Whiplash begins to look like a bona fide creation myth, one destined to blow the minds of John Bonham fans everywhere. Cinephiles are witnessing a breakthrough, too: Syncing his newfound formal chops—his surgical editing, his gift for filming musicians at work—to the pulse of his driven hero, Chazelle pays off his own potential in a big way. Speaking of whiplash: Maybe it was the 10 p.m. start time, or the misfortune of following a truly exciting film, but the documentary Dinosaur 13 ( Grade: C) proved an extremely underwhelming encore. The film chronicles the story, dubiously described as “brilliant” by the narrator, of the paleontologists who found an almost completely intact T. rex skeleton in the badlands of South Dakota. “Sue,” who now resides at the Field Museum in Chicago, was wrestled from the hands of her discoverers, ruining their plan to turn the amazing specimen into a local tourist attraction. Some of what happened next is worthy of outrage; if nothing else, the film says some fairly damning things about the U.S. justice system. But director Todd Miller conflates multiple points, creating a false equivalency between one man’s sad legal fate and the more complicated issue of archeological ownership. Dinosaur 13 ultimately feels like something of a pity party, characterized by one-sided talking-head analysis and cursed with a gratingly manipulative score. Its formal shortcomings were especially glaring in the afterglow of Whiplash. Maybe Sundance should rethink this opening night strategy and just put its single best foot forward.